Mindfulness. I’ve heard this term thrown around quite a bit over the last few years and if you asked me if I knew what it meant, I’d have said yes. Just like I did to my good friend who then asked me to explain it to her. “Err… Uhh.. Well it’s about being mindful.” Yeah. A tid bit vague on the description there, Meg. So allow me to assist you (and avoid any future embarrassment) regarding a fuzzy understanding of what mindfulness really means. Four little words. But really think about them. How often are we really paying attention? You’ve been present in your particular moment for at least 30 seconds while finding and beginning to read this post. Are you paying attention? Who is around you? What’s the temperature of the air touching you? Check in with your body. How deep are your breaths? Feel the beats of your heart. If you’re sitting, what does the surface beneath you feel like against your person? Is this easy for you? Or are your daily tasks already infiltrating your thoughts at this exact moment, distracting and hijacking you from the present? Exercising awareness to the present moment is what makes up a mindful practice and it is often used as a therapeutic technique. Regular practice of mindfulness has shown to affect both brain function and structure actually increasing both the activity and the area of our brain responsible for positive emotion. One study showed that mindful based cognitive therapy reduced the risk of relapse of depressed people by an impressive forty-three percent. I have sincere admiration for this practice because I find it to be one of the most difficult to implement in my life. I experience a constant stream of messages, voices, thoughts and actions flashing through my subconscious minute to minute— like several movies competing on one screen simultaneously, while in fast forward. The chaos of this multi-tasking mentality can truly dull the mind and soul’s ability to fully appreciate and absorb life’s experiences… if you let it. One of those important experiences being when we eat food. Food goes into your mouth several times a day but how often do you think beyond the bites? Knowing that you’re eating is not the same as mindfully eating. Even though we are aware of the physical action, our minds are often elsewhere thinking about a million different things: television, to-do’s, friends, work, etc. A very small part of our awareness is actually focused on eating and even less on the emotions or feelings occurring at the same time. This often leads to a variety of problems such as emotional eating and overeating. Researchers are learning that teaching overweight people mindful eating skills such as paying closer attention to your bodies’ hunger cues and learning to savor food can help change unhealthy eating patterns and support weight loss. And, unlike other forms of treatment, mindfulness may address the actual underlying problem behind the tendency to overeat (cravings, stress, and emotional eating) which makes it so hard to overcome. Ah, an eating challenge… my favorite kind! 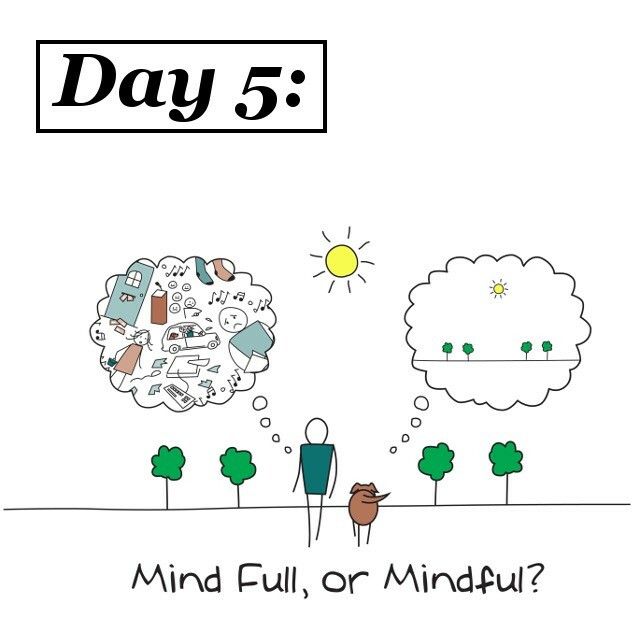 Let’s practice a little mindfulness with this short, meditative exercise. It only takes a few minutes so soak up the moment, the food and the chance to savor life’s little pleasures with the one you love. Begin by exploring this little piece of food, using as many of your senses as possible. First, look at the food. Notice its texture, color and weight in your hand. Explore the food with your sense of touch. What does this food feel like? Is it hard or soft? Grainy or sticky? Moist or dry? Notice that you’re not being asked to think, but just to notice different aspects of your experience, using one sense at a time. This is what it means to eat mindfully. Before you eat, explore this food with your sense of smell. What do you notice? Now, begin eating. No matter how small your piece of food, take at least two bites to finish it. Take your first bite. Before you chew, allow the food to sit on your tongue for a few moments. How does it feel? Hard or soft? Have your taste buds begun to dissect its sweetness? Begin chewing very slowly, noticing the sensory experience of chewing and tasting. Remember, you don’t need to think about your food to experience it. Close your eyes for a moment to focus on these sensations. Continue to notice the texture of the food; the way it feels in your mouth. Notice if the intensity of its flavor changes, moment to moment. Take about 20 more seconds to very slowly finish this first bite of food. Now take your second and last bite. Chew slowly and continue paying attention to the sensory experience of eating this piece of food from the second it touches your tongue, caresses your taste buds and travels down your throat. Just pay attention — with purpose. Swallow your last bite and open your eyes, if closed. Discuss with your partner what novelties you noticed about this piece of food, your eating experience and how you might implement a portion of mindful eating practice into your daily life. This “Mouthful of Mindfulness” concept of creating a truly sensational experience can be implemented every minute of each meal. Note that it isn’t always necessary to eat as slowly as our exercise to eat with mindfulness but it is helpful at first to slow down to practice this art. Here’s a handy guide from Eating Mindfully to guide you while practicing this technique. Print it out and put it in your kitchen to help you evaluate your hunger, listen to your body and maximize your wellness at every meal.